Buy any of our ANE eBooks before end of June 2015 and get the full source code for this template completely free. You want to build a multi-platform native extensions, but don’t want to spend time setting up all the tools and projects. We have done this for you. How does this save you time? and you see how to use all that to have a multi-platform native extension with one click. And debug it too! 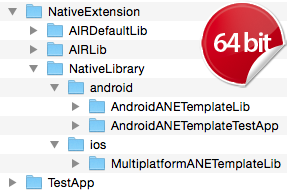 You need a starting point to write a multi-platform ANE (iOS+Android)? Here is a template to give you a kick start. It comes in two bundles: FREE and Source code. a comprehensive PDF manual + information on how to build it from the source, should you follow the tutorial. You can use it as a starting point of any iOS and Android ANE. We release something new every couple of weeks. Want to know when the next free ANE is out? We release something new every couple of weeks. Want to know when the next free ANE is out?